I'M BACK! In case you haven't noticed I took a small break from serious blogging, which I explained in my first Facebook live last week. If you missed it, I'll link it HERE for you. :) However, if you DID catch that video, you know that I've totally changed the way I eat, and with that, I shared with you that there will be a lot of healthier recipes on here from now on (as well as the fun stuff), but I made a strong promise that each and every one of these recipes will be DELICIOUS! Today's Italian Style Baked Eggs with Asparagus is the perfect example of that. 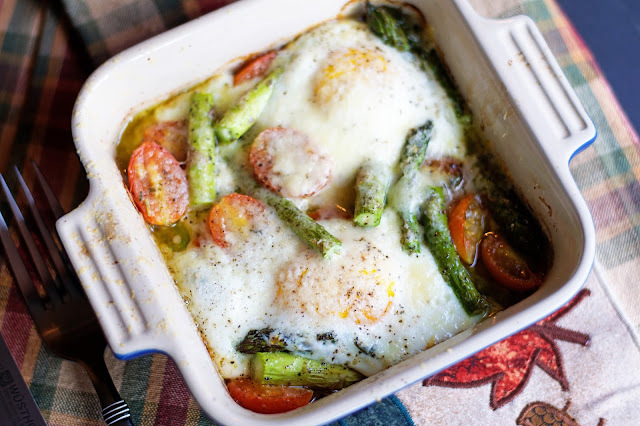 Packed full of healthy proteins and vitamins, these Italian Style Baked Eggs with Asparagus have become one of my go-to breakfasts or lunches. I know you are going to love it, and I can't wait to share it with you. Next you will need to crack your eggs into a dish and let them come to room temperature. I know this seems like a silly thing, but it ensures that the yolks will remain runny and not over cook. I don't pretend to know the science behind it, but just trust me...it works. Now you will need to trim the woody end from the asparagus. To do this I usually bend the asparagus, and the point at which it breaks is where the good part and the woody end separate. Next I cute the good part of the asparagus into bite-sized pieces. Now I place the bite-sized pieces into a baking dish. I have these cute, Le Creuset, personal sized ones, but if you don't have any, an oven safe skillet will work great. However, if you are interested, I will link them HERE. Now place the halved cherry tomatoes into the baking dish. Using your hand give everything a toss so that everything is coated in the oil and seasonings. Now place the baking dish into the preheated oven and bake for 10 minutes. After 10 minutes remove the baking dish from the oven and add the eggs. Grate the fresh Parmesan over the top over everything, and remember, a little goes a long way. I took this before I realized I forgot to add the cheese. WHOOPS! Then place everything back into the oven for 5 more minutes. You can toast a piece of whole grain bread for toast to dip into the egg yolk for breakfast. For lunch, I like to eat this with some sautéed kale, and with dinner I would eat it with a large garden salad! 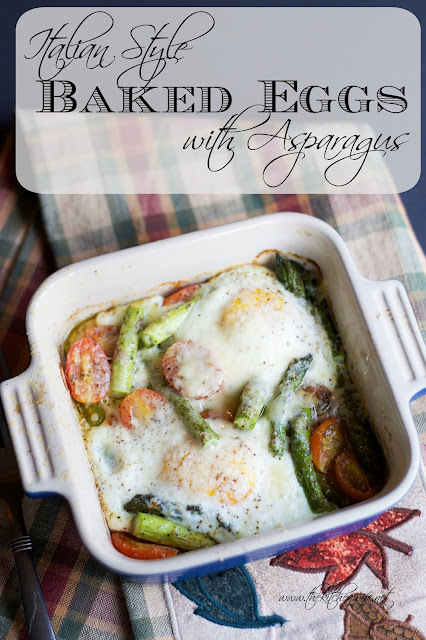 These Italian Style Baked Eggs with Asparagus are so versatile, they really are perfect for any meal. So if you are in a pinch tonight, and need something fast, healthy, and delicious give these a try! Crack the eggs into a dish and allow to come to room temperature. Trim the woody ends off of the asparagus, and cut into bite-sized pieces. Place the asparagus and halved cherry tomatoes into a baking dish. Drizzle the oil over everything, and season with salt, pepper, Italian seasoning. Toss everything around until it is all coated with the oil and seasonings. After 10 minutes remove from the oven and add the eggs to the baking dish. Top with the fresh grated Parmesan cheese and return to the oven for 5 more minutes.